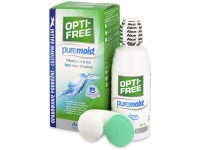 This small, handy bottle of OPTI-FREE PureMoist solution effectively disinfects all types of soft contact lenses, and is the perfect choice for travelling. It's designed to enhance the comfort of contact lens wear and remove lipids and proteins. 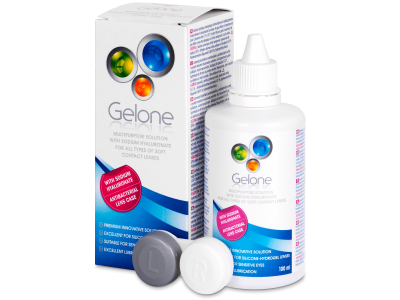 Gelone multipurpose solution effectively cleans and moisturises your lenses. This solution is suitable for all types of soft contact lenses. Gelone solution contains sodium hyaluronate, which is a natural lubricant found in the human eye. OPTI-FREE PureMoist is a multipurpose solution produced by Alcon. The solution effectively cleans, rinses, and stores all types of soft contact lenses. OPTI-FREE PureMoist contains the brand's patented HydraGlyde Moisture Matrix technology that helps provide up to 16 hours of moist, comfortable lens wear. This effective, but gentle formula efficiently removes lipids and proteins and kills germs. This 90 ml bottle of PureMoist Solution also includes a contact lens case. The solution should be used within 6 months of first opening. Read more about OPTI-FREE PureMoist solution.